The Command Editor is a utility that allows editing of instructions (commands) for transitional maneuvers. This is particularly useful if you are teaching a military or show-style ensemble, or if you need a printed reference of visuals cues for performers. 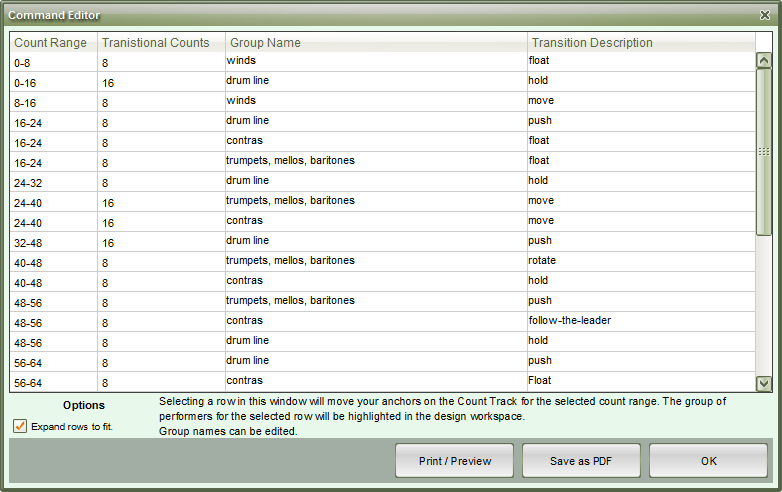 These commands are generated by using any of the Drawing or Editing tools to transition performers in the drill. Commands are instructions to perform various tasks in a drill. They can include both transitional commands (such as follow the leader) and visual commands (such as horns down). To print visual commands, see the Performer’s Report section. The Transition Description column only contains basic commands that 3D has determined as descriptive for the maneuver. Any command in this column can be changed by selecting the appropriate cell and entering the command you wish. Much like the Transition Description column, Group Names can be edited. Why Are All of My Groups Untitled? The Group Name column pulls the names of groups from the Selection History tool. Grouped (glued) performers in the Selection History tool can be renamed while in the tool, and that naming convention will carry into the Command Editor. If you see nothing but (untitled) in the Group Name column, this means no groups (selections) have been renamed from their symbols in the Selection History tool. You can easily rename any Group Name by clicking in the appropriate cell and typing the name you desire. *Whenever you click on a row in the Command Editor, your Anchors on the Count Track jump to the count range and the performers for that selected command will highlight on the field. This allows you to verify you are editing data for the transition and/or group you intended. Print/Preview allows you to print the Command Editor list. Save as PDF will create a PDF file of the Command Editor.